Because I did not write here over the weekend while traveling to the satellite office of Ben Bass and Beyond, I have decided to extend Puzzle Week for a few more days. 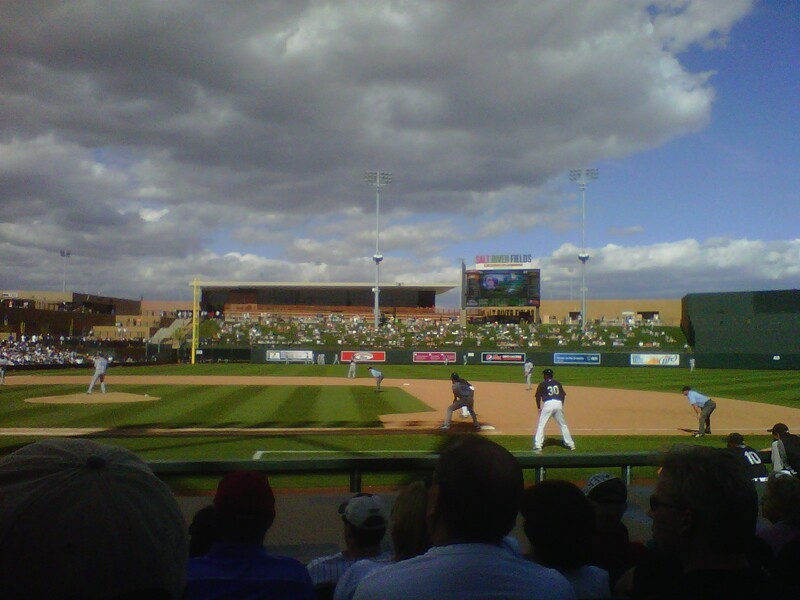 So I'm at a spring training game yesterday at the Salt River Fields at Talking Stick complex, the sprawling new Cactus League home of the Arizona Diamondbacks and Colorado Rockies (11,000-seat ballpark, 12 practice fields, hosted by two Indian tribes, price tag $100 million). During the late innings of the game, about 10 Los Angeles Dodgers start running sprints along the warning track in left field (see photo). Um... dudes? Didn't you notice there's a game going on? Ben, you're a Travelin' Man.